Maui Meals on a Budget | Fit Family Robinson | The world is your gym. Some quick math: 4 people x 3 meals per day per person x 10 days = 120 meals. At your typical mid-range restaurant in Maui, that’s $1,800-$2,400 to feed the crew for 10 days. If that’s in your budget, bon appetit! If, like us, you need to stretch the food dollars, especially during extended travel, you’ve got to hit the grocery story for most meals and pick your dining-out options wisely. We managed, during 10 days on Maui, to dine out just four times. The key: Costco. It’s just a few minutes from the airport and prices are basically the same as the mainland. And judging from the crowd, it might be the most popular tourist destination on the island. For $237 we were set for our entire stay, with food left over. Fred’s Mexican Cafe in Kihei. The Gazebo in Napili. Great breakfast place with a beautiful view. We could see humpback whales breaching offshore while we ate macadamia nut pancakes. Cafe Mambo in Pa’ia. The quinoa bowl is fantastic. Perfect stop after a morning on Haleakala. 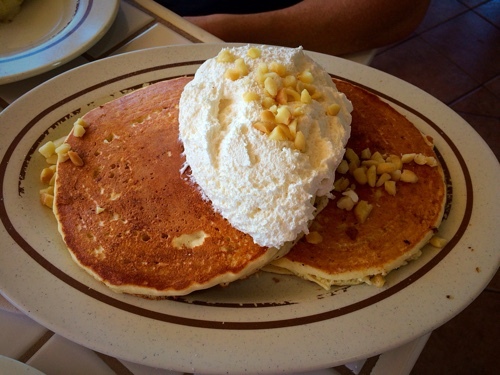 Macadamia nut pancakes at The Gazebo. 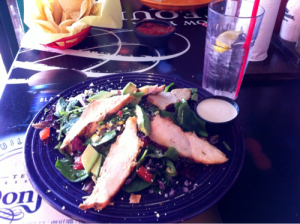 The Kihei Salad at Fred’s Mexican Cafe. Workout: Hit the abs while you’re at the pool.